Wat is dit voor site? Wij zoeken de goedkoopste boeken op internet. 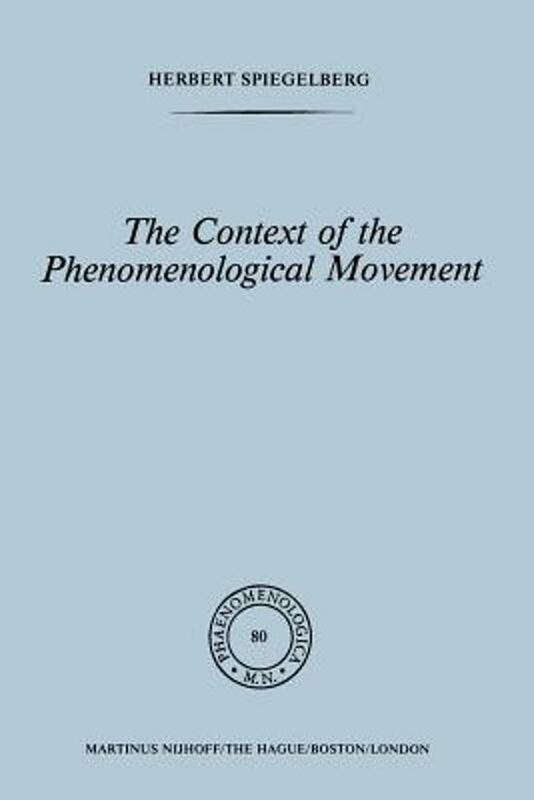 The Context of the Phenomenological Movementvonden we het goedkoopst op Bol.com voor €149.99. We hebben gezocht in nieuwe en tweedehands boeken. Rechtsonderaan de pagina kan je het boek direct bestellen	via Bol	.com. This is an unashamed collection of studies grown, but not planned before­ hand, whose belated unity sterns from an unconscious pattern ofwhich I was not aware at the time ofwriting. I call it ''unashamed'' not only because I have made no effort to patch up this collection by completely new pieces, but also because there seems to me nothing shamefully wrong about following up some loose ends left dangling from my main study of the Phenomenological Movement which I had to cut off from the body of my account in order to preserve its unity and proportion. This disc1aimer does not mean that there is no connection among the pieces he re assembled. They belong together, while not requiring consecutive reading, as attempts to establish common ground 1lnd lines of communication between the Phenomenological Movement and related enterprises in philo­ sophy. They are not put together arbitrarily, but because ofintrinsic affinities to phenomenology. This does not mean an attempt to blur its edges. But since they are growing edges, any boundaries cannot be drawn sharply without interfering with the phenomena. Nevertheless, in the end the figure of the Phenomenological Movement should stand out more distinctIy as the text against its surrounding context, ofwhich these studies are to provide some ofthe comparative and historical background. This is why I gave to this collection the titIe ''The Context ofthe Phenomenological Movement'' in contrast to the central ''text'' as contained in my historical introduction to this movement.